Two Point Hospital is the spiritual successor to 1997’s Theme Hospital. I have to admit that being assigned to review this made me scared and excited. I played Theme Hospital back in the day, and it’s quite the gem, so I didn’t want to be let down by Two Point Hospital. Like Theme Hospital, this is a top-down, isometric business management game about hospitals that adopts a cartoonish take on the subject. A contemporary game you could compare it with is Surgeon Simulator, the laugh out loud “simulation” of what it’s like to be an ambulance surgeon. Two Point Hospital takes managing a whole hospital to similarly comic extremes. It’s an absolute joy, starting up the game to be greeted with pleasant music that stuck with me even when I was at work. The first time I heard the P.A. system in which the lady sasses you, it felt so good. Waves of nostalgia poured in with the long hours I’ve played. Two Point Hospital begins in Two Point County, where you are charged with setting up and designing the hospital to your specifications. You pick out rooms, make the hiring decisions for the doctors, nurses, assistants and janitors who will keep your hospital running. All the broad management decisions are yours and yours alone to make. You’re guided by a couple of goals that unlock progress into the next hospital, in which the difficulty goes up and you get more stuff to play with. It’s pretty boilerplate stuff for games of this genre, and the overall goal is to build a self-sustaining hospital that can operate on its own. The influence that Theme Hospital bestows on Two Point Hospital extends beyond the unique gameplay. Which is great, because a modern day successor was something I’d wished for. It truly captures best of the classic that inspired it and builds upon it. I love the quirky illnesses these little people get. In Theme Hospital, patients could get a disease called Bloaty Head. Doctors treated it by simply puncturing their heads and then re-inflating them in an inflation room. Hilarious and the kind of slapstick comedy I loved as a kid. Two Point Hospital’s equivalent is Light Headed, in which patients come in with light bulbs for heads. I’m not sure how such an illness works, but they get sent to the De-Lux Clinic, to get their heads unscrewed and replaced. Two Point Hospital definitely doesn't take itself seriously, but that doesn't necessarily mean the gameplay is bad. It's quite the opposite. The controls work perfectly fine. If you've played a little game called Sims or any of it's sequels, they work almost the same. Moving throughout the hospital you manage is a breeze. Small pop-ups from a hospital director advise many aspects of the game, or outright ask you to do things in the name of progression. It doesn't hamper the freedom you're given on how you choose to play a particular hospital either. Soon enough you'll start wanting to make edits on the hospital to find out what designs or priorities are the most efficient for you, your staff and patients. Doctor Required In GP's Office! However, after over thirty hours of gameplay, some issues start presenting themselves. AI pathfinding issues add up when the hospital gets more crowded. Suddenly all your GP offices are not enough anymore and need to be prioritized full time. I’m not sure if it’s a bug or a feature intended to deliberately spike the game’s difficulty as your operation becomes more complex and patients keep coming in. I ended up restarting several times just because i wasn't content with how I went about things. Personally, I didn’t really mind. I enjoyed starting over from scratch to rethink my choices, and in effect the game’s pathfinding problems challenge me to find a better way to widen out these bottlenecks. But for others, the chaos that results might be less than desirable. As patients pour in, it can be difficult to cope. Regardless of what your design preferences might be, careful planning is a must as you progress. And for some, the realization might be too late when they realize their staff isn’t properly equipped to handle the large masses of clowns, mimes, and people who simply got their head stuck in a frying pan because they thought it would be a great idea to have it as a last minute costume for a party. Another related issue is how some of the patients choose to wait on the other side of the hospital instead of close to the room they are queueing up for. Some of them literally die waiting for a room to be open because they decided to do something else instead of waiting in the immediate vicinity of the room. I understand the game is still new, so some issues on release are expected. Thankfully, we live in an age where post-launch updates are a smaller matter than they were before. 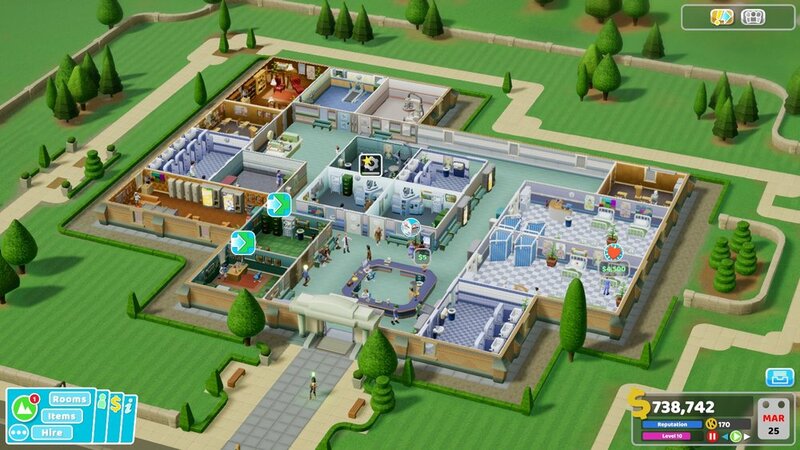 Some of the things I’d probably want in the future is the ability to assign janitors by sector, to give single room assignments to doctors and nurses, the option to copy rooms you’ve design and of course, a sandbox mode. Two Point Hospital is available now on Steam for $34.99 / 1,299.95php. Valkyria Chronicles 4 is getting a worldwide release and is sticking with their famous turned-based strategy gameplay. Fans are going to go nuts with the character creation tool. New races, four added continents, and a bonus for those who own the first game.